At first glance, Game Night might not look like a winner. A comedy featuring potentially unlikable characters released in February raises an eyebrow. That was the impression given by the movie’s teaser trailer, though the full trailer shows that there’s some heart to this story. It’s not just people being mean to each other for no good reason, other than it makes for funny jokes and gags. 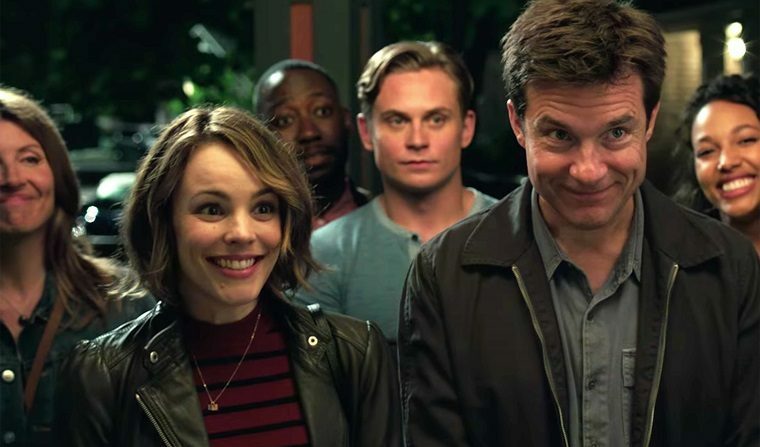 Max (Jason Bateman) and Annie (Rachel McAdams) are actually an appealing couple who enjoy the time they spend with their close group of friends. Directors John Francis Daley and Jonathan Goldstein (Vacation) helped themselves greatly with their casting. The ensemble is the strength of this movie, with characters who seem like they could easily be in your circle of friends. Maybe they’re very similar, like Kevin (Lamorne Morris) and Michelle (Kylie Bunbury) — childhood sweethearts who are still together well into their 30s. Or Ryan (Billy Magnussen), who’s perpetually dating and always bringing someone new to the get-togethers. Everyone is funny and fills their role in the story well. Even the bad guys are well cast and should cause some smiles when they make their appearances. And though she doesn’t have a big role, Sharon Horgan (Catastrophe) brings just enough of an outsider’s perspective to highlight the absurdity of the story and add flavor to the mix. Daley and Goldstein have been in talks to direct the Flash movie, Flashpoint, for Warner Brothers and there’s an impressive sequence in the third act that shows they could be right for such a gig. It’s basically a game of hot potato which follows each character around a house as the action comes their way. Maybe the scene is a bit too showy and out of place with the overall story, but it’s a fun bit of camera work and provides some thrills. McAdams was due for a comedy after more serious roles in True Detective and Spotlight, and being terribly wasted in Doctor Strange. (Did you even remember she was in that movie?) And Game Night is very fortunate that she has a lead role among the cast. Annie is the gas this movie runs on. Max can’t be too insufferable because Annie is just like him. Actually, she might be more competitive and just a bit more functionally deranged. Everything seems OK because Annie seems like the smartest, most rational of the bunch. You’d figure she’s the straight man to everyone else’s wackiness. Yet she’s the one who pushes the game further in her zeal to win (and her ambition to see Max get over his inferiority complex with his older brother). She’s kind of the dream woman, but not in a Manic Pixie Dream Girl kind of way. She’s just the one who indulges Max’s best impulses (and maybe a few of the worst ones), letting him be himself because that’s who she is too. Let’s keep writing more smart (and even not-so-smart, as long as they’re funny) comedies for Rachel McAdams, Hollywood. OK, we probably throw around terms like “national treasure” and “the best” around far too often as a culture. But it applies to Jesse Plemons. If he shows up in a movie or TV show (like Black Mirror), there’s a chance it might be pretty good. Or at the very least, the scenes he’s in and the characters he plays will be enjoyable to watch — even when they’re small roles in recent films like Hostiles or The Post. That’s certainly the case here. Virtually everyone else in the story is a witty, engaging personality who’s good to contribute a joke to the dialogue and keep things moving. Plemons’ character, Gary, always brings the narrative to a halt to hilarious effect, creating incredibly awkward situations with his lack of social grace and deep yearning to be included in the fun bunch that gets together every week next door. Gary could be a sympathetic character, the guy who’s being excluded because he’s weird and makes everyone uncomfortable. (Plus, Max and Annie were friends with his wife, who no longer comes over after divorcing Gary.) Yet he’s creepy enough, and maybe just a bit too intense, that it’s apparent how he makes things awkward and understandable that he’s not invited over for game nights. Plemons conveys both aspects of Gary really well. He knows what’s going on, yet can’t hate those guys because he wants to belong so badly. Maybe Game Night will get steamrolled by the Black Panther juggernaut. But it’s a good alternative for those who might not be interested in a superhero flick, and a fun change of pace for those who already saw King T’Challa and the Dora Milaje, but still want to go to the movies.